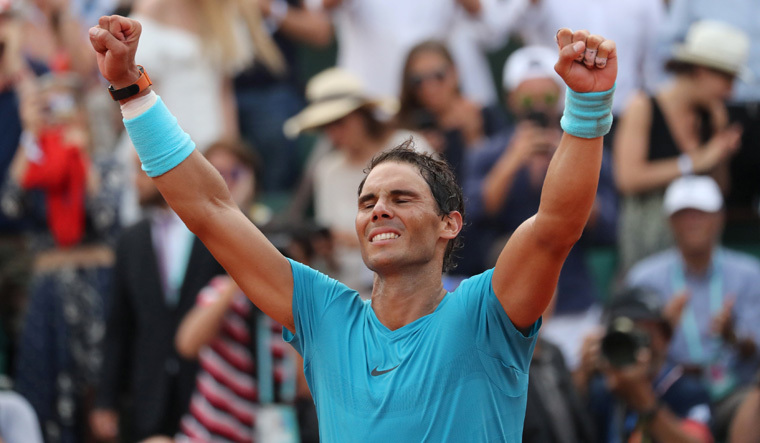 Rafael Nadal claimed an 11th French Open title today with a 6-4 6-3 6-2 demolition of Dominic Thiem despite a worrying injury scare in the closing stages of the final. "It's really incredible. I played a great match against a great player," said Nadal. "I had tough moment in the third set with cramps in my hand. I was very scared but that's sport – it was very humid. "To win 11 times here – it's fantastic and not something I ever dreamed of." Nadal joins Australia's Margaret Court as the only player to win 11 titles at the same major. Victory also took Nadal's record at Roland Garros to 86 wins and just two losses. With a celebrity audience – including actors Hugh Grant and Tim Roth as well as French stars Marion Cotillard and Jean Dujardin – watching, Nadal flew out of the blocks.